The Argentinean post-punk trio are back with a new member, Manuela Ducatenzeiler on bass. Their new album, Friends & Lovers, delivers a sound that strikes with an electric feeling that is cool and sharp. In a sort of subtle way, this new record is a beautiful and haunting listen. It muddles the line between the distorted sounds made in the garage with the overwhelming, dark sensations of new-wave induced psychedelia. It’s a defiant attitude that invokes a nod toward The Slits, but with a borderline poppy flare—kind of like what one could see in the vein of Thee Oh Sees, but with the abrasiveness of a 1980s post-punk group. These are the factors that mandate the spark of devilish intrigue into Las Kellies. Absorbing this record is much like dancing with the devil itself. At first, the upbeat, static-like style of tracks like “Suger Beat” are warm and inviting. It’s groovy, and it’s something to move to. Digging deeper into the grooves of the record offers a trance-like experience that reveals Las Kellies’ dabblings in noises from the new wave. It’s primitive post-punk with a poptastic coating. With the preemptive attitude that this is a soundtrack for spacing out, the mind will be invited to wander the depths of the universe. Admittedly, that might be a stretch to suggest—however, if one switches on “Make It Real,” they might gather a taste of a similar understanding. 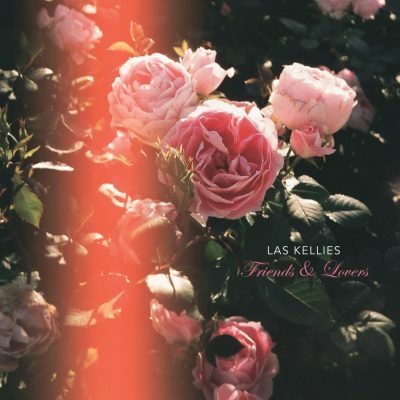 Las Kellies’ Friends & Lovers falls in line with the popular sentiment of being provocative through simplicity. It is at once stripped, jumpy and edgy. It’s noise that hooks its listener and plays that person like a puppet. “I’m on Fire” or “ I don’t Care” are tracks that stun their captive listeners into moving while enjoying the reactions of assertive, catchy punk. The reasons for adding this record to the legion of primitive-sounding post-punk types out there can be significantly narrowed down. For starters, Las Kellies master the simplicity of what they produce in the stunning quality in which they play. It’s well done and doesn’t rely on shock and awe only to get the listeners’ attention—melody, rhythm and attitude are very much alive and well. This is the kind of music that invites listeners on a journey of serenity. In their ability to be overwhelming, they don’t attack the listener with the senseless barrages of raw rock n’ roll. Rather, it’s a sound that takes control by pleasantly guiding the listener. It could be said to be sweet with an edge and kick.